This spider-man bike is superior matte blue and scarlett red with web grips and web tread tires. The Marvel spider-man components have fun and innovative hooks to attach toy figures to webs. It has 16" x 2.125" Sidewalk tires, 20-spoke red rims, and wide training wheels which add stability. 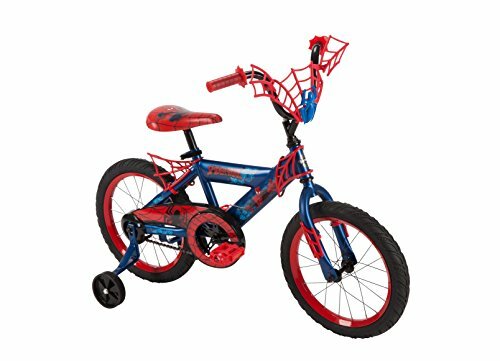 With a bold blue color, this Marvel Spider-Man bike (#21967) is ideal for your 4-6 year old child, with a height of 42-48 inches. The Marvel Spider-Man web handlebar feature includes hooks for attaching action figures - an easy way to bring them along for the ride. The unique 16" web tread tires, sturdy training wheels, and an easy-to-use coaster brake make riding comfortable and build confidence for beginning riders. The chainguard has decorative Spider-Man web graphics to add to the overall fun. Fast assembly in just 5 easy steps. An adjustable wrench is the only tool you'll need. In just a short time, it will be ready for your child to ride. Plus, there's a seat quick release for easy height adjustment. All the amazing graphics add up to one fun bike to ride! 5-Step Assembly - ready to ride in minutes!